Measuring errors can easily occur when small voltages are measured or voltages must be determined very accurately. This article discusses a number of causes that may affect the measurement of voltages and currents. Fig. 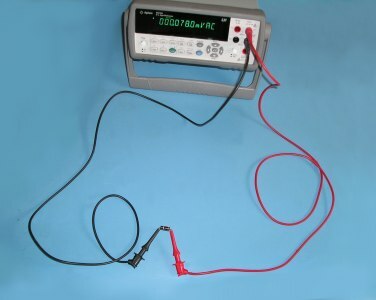 1: A measurement set-up where a closed ground loop is made. With some measurement instruments like oscilloscopes, the ground (or LO input) is connected to the earth terminal. When two of such instruments with an inner connection to the earth are used in a test set-up, a ground loop will be made. This situation is shown in Figure 1. Because a voltage (Vg) can exist between different earth connections, unwanted ground currents (Ig) are generated. This situation will be worst if both instruments are not connected to the same junction box. Fig. 2: A measurement set-up with an open ground loop. Earth currents can be prevented or reduced by interrupting the ground loop. This is possible by using equipment (power supplies, signal generators, etc.) whose inputs and/or outputs are isolated from the earth connection. For safety reasons never disconnect the earth terminal of an oscilloscope. Figure 2 shows a measurement set-up that uses a source that is isolated with respect to the earth. But a full insulation is never possible: There is always some leakage resistance and parasitic capacitance here represented by the 1 MΩ resistor and 40 pF capacity. Z is the impedance formed by the resistance and capacitance to the ground. The total resistance is much higher compared with a closed ground loop. The current Ig is very small and has a minimal effect on the input voltage Vin. At high frequencies, the impedance Z is so small that its influence is no longer negligible. Fig. 3: A Common Mode Voltage can cause measurement errors. Measuring instruments with input terminals that are isolated from the earth have a differential input. The measured differential voltage Vdiff is the voltage different between the positive and negative input terminals. These instruments are also more or less sensitive to a common voltage Vcomm between the two inputs and the earth. To what extent the common mode voltages are suppressed is indicated by a CMRR (Common Mode Rejection Ratio) value. This value is often expressed in dB and is always specified at a certain frequency. Here E is the transient induced voltage, dB/dt the change of magnetic induction per unit time and A is the area of the loop. The larger the surface area of the loop, the greater the induced voltage. Fig. 4: External alternating magnetic field induces voltages in a wide loop. Fig. 5: Twisted leads reduce the disturbing effect of external magnetic fields. The effect of induced currents can be reduced by making the surface of the loop as small as possible. Bringing the test leads near as possible in a parallel way can do this. In practice, the test leads can be twisted as shown in Figure 5. In this way the measured AC voltage is reduced to 0 µV, while the arrangement with the wide loop in figure 4 measured 78 µV. Fig. 6: Tribo-electric effect is measured on a RG58 cable when abruptly impacted. Cables who are subject to vibration or movements generate internally a charge difference. This charge will be translated into a current. If the cable at both ends is high-impedance terminated, significant voltage differences can be generated. This is called the tribo-electric effect and is most noticeable on coaxial cables. The tribo-electric effect is caused by friction between the conductor and the insulator. Thereby electrons are rubbed free and create a charge difference. Figure 6 shows the tribo-electric effect in a practical situation. A 1 meter free hanging end of a 2.5 meters long RG58A coaxial cable was subject to an impact. The only load was the 1 MΩ, 16 pF input of the oscilloscope. In this example, a peak voltage of 36 mV was generated. In case where small voltages are measured, it is important that the cables can not move and are not subject to vibration. Using special cables with other types of insulation can reduce the tribo-electric effect. Fig. 7: Thermoelectric voltage across a junction of two different metals. Here S1 and S2 are the Seebeck coefficients of the two metals that are connected en make the junction, in this example copper and aluminium. The Seebeck coefficients for various metals are listed in the table on the left. The metal that is highest on the list of the two metals will become the positive one. Thermo-voltages in a closed circuit. An electric circuit, including measuring circuits, will in practice be a closed loop. Figure 8 shows a measuring circuit where three different metals are used: constantan, copper and aluminium. The voltage across the constantan wire Vb of (5 mV) is the voltage that must be measured. This could for instance be a current shunt. The copper wires are the connections to the instrument, and the instrument itself is made of an aluminium wire. Fig. 8: Equalisation of the thermoelectric voltages in a closed electrical circuit. Each of the two junctions constantan/copper has a temperature of 60 °C (=333 K). Each junction will therefore generate a voltage of 13820 µV. But because the voltages over these junctions have an opposite polarity, they cancel each other out. Behind these junctions the potential difference of 5 mV is therefor still the same as the voltage source. The same applies for the two copper/aluminium junctions. Here the temperature is 293 K and the thermoelectric voltages are both 1026 µV, and again the voltages are the opposite of each other. Therefor the instrument measures exactly the source voltage: 5 mV. Fig. 9: Measurement errors caused by differences in thermal-electrical voltages caused by uneven temperatures. Figure 9 shows the same situation, but one of the constantan/copper junctions has a higher temperature: 80 °C (=353 K). Hereby generates this junction a slightly higher thermoelectric voltage: 14650 µV instead of 13820 µV of the 60 °C junction. The difference in these two thermo-electric voltages is 829 µV and is noticeably behind the junctions. The voltage between the two copper wires is now 5829 µV instead of 5000 µV. The source voltage with the added fault voltage caused by the temperature difference is transferred to the measuring instrument. For accurate measurements and/or measuring small voltages, it's important that the measuring terminals have a good thermal connection to maintain an equal temperature for every junction pair. Electrochemical potential differences occur at places where there is a poor connection that is also polluted and humid. These induced voltages can be tens of millivolts high. The electrochemical voltages are most distinct when the connection consists of two different metals. Always ensure that contacts are clean, free of oxidation and dry. Two equal metals can also generate weak currents caused by chemicals. E.g. by flux residue that is left behind on circuit boards after soldering. It's therefore important to remove the flux with isopropyl alcohol. It may be regarded as obvious that errors might occur if measuring instruments are used outside their specifications. However, sometimes this happens unconsciously. Impulse voltages can cause an overload of the input circuit of a measuring instrument. The peak voltage is much higher than the average or RMS voltage. There is great risk of damaging the instrument and measuring errors occur because there is no warning indication that the maximum amplitude has been exceeded. An example of such a waveform with the corresponding voltage values is shown below. Fig. 10: Measuring an impulse voltage. The duty cycle of this signal is 10%. Although a low voltage is measured, the peak amplitude is 10 times higher than the average voltage and over three times higher than the RMS voltage. This situation occurs for example where a fly-back transformer is used. The input circuit of a conventional multimeter has a low-pass filter. This will cause the average voltage be measured correctly, but it's high impulse voltage can overload the input circuit. Parts can fail by voltage breakdown or burning. Except damage, the change that measurement errors occur is much larger with True RMS meters. The RMS voltage is calculated using the momentary input voltages. If the instrument is set to a more sensitive range in response to the low value displayed, there is a possibility that the input amplifier will be overloaded. Good true-rms meters will have an overload indicator to warn the user. If not, you will need an oscilloscope to check whether the instrument is overloaded or not. 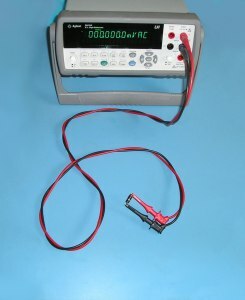 An ordinary multimeter is unsuitable for measuring high frequency signals. The normal frequency range is only a few thousand hertz. True RMS meters often have a slightly higher frequency range. The frequency range of multimeters is specified whereby the measurement accuracy is within the specified tolerance. The frequency range of an oscilloscope is usually given at the -3 dB point. The amplitude is then approximately 0.7 times the original level. Not only the measured fundamental frequency must taken into account to the specified frequency range. Higher harmonics of non-sinusoidal signals are already weakened long before the fundamental frequency has reached the maximum specified frequency. Fig. 11: 10 MHz square wave measured with a 200 MHz bandwidth limitation. Alongside an image of a measurement on a 10 MHz square wave. The bandwidth of the oscilloscope is 200 MHz. The measured rise and fall times are well within the specified 8 ns of the source signal. Both the fundamental frequency as well as the higher harmonics are mostly unimpaired. Fig. 12: 10 MHz square wave measured with a 25 MHz bandwidth limitation. In the next example the bandwidth of the oscilloscope is now 25 MHz. The weakened steep slopes of the measured signal are clearly noticeable. The fundamental frequency is almost unaffected, but the higher harmonics are strongly attenuated. The result is a distorted image of the original waveform. Fig. 13: Graphical representation of the attenuation of a 25 MHz bandwidth. The graph in figure 13 shows the attenuation as a function of the frequency of an oscilloscope with a bandwidth limit of 25 MHz. Not only weakens this the signal at higher frequencies, also the phase shifts. How the higher harmonics of non-sinusoidal signals affected by this attenuation will be explained below. Fig. 14: The attenuation of the harmonics around the cut-off frequency. A square wave consists of a large number of harmonics. In figure 14 the harmonics of an ideal 10 MHz square wave are shown as black bars till the 13th harmonic. In this frequency range, the attenuation due to the 25 MHz low-pass filter is shown as a thin red line. The blue bars show the resulting harmonic attenuation of the original harmonics. Clear visible is that the higher harmonics disproportionately are more impaired than the lower harmonics. Not only when using oscilloscopes, but also with all measuring instruments the attenuation of harmonics should be considered when measuring non-sinusoidal signals near the cut-off frequency.